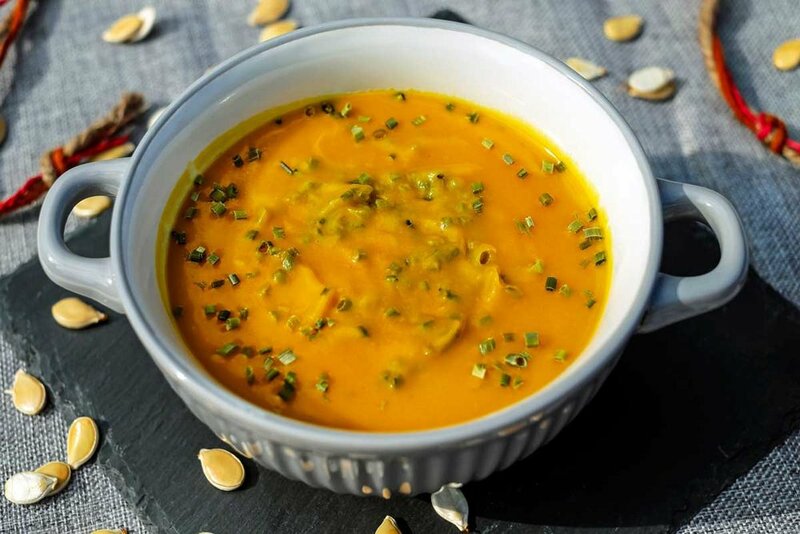 Create this Indian style pumpkin curry with spices and coconut milk, perfect for Autumn! Boil pumpkin pieces in water until they turn soft (about 20-minutes). Heat the oil in a cooking pan over moderate flame. Add cumin seeds, cook for a minute until they roast into a golden brown color. Add chopped ginger, garlic, onion, peppers. Cook until the onion turns translucent. Add garam masala and salt. Add pumpkin pieces and boiled chickpeas to the above mixture. Add 2 cups of water and let it simmer for 10 minutes. Add coconut milk and bring to a boil, reduce heat. Simmer covered for another 5 minutes. Serve warm, garnished with chopped chives or cilantro leaves.